Except that a somewhat fussy angel and a fast-living demon are not particularly looking forward to the coming Rapture. They've lived amongst Humanity for millennia, and have grown rather fond of the lifestyle. So if Crowley and Aziraphale are going to stop it from happening, they've got to find and kill the AntiChrist (which is a shame, really, as he's a nice kid). There's just one glitch: someone seems to have misplaced him. What could possibly go wrong when an Angel and a Demon team up to try and stop the Apocalypse from taking place?! 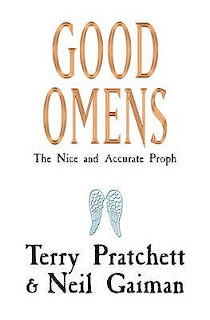 In Good Omens we get to see their attempts at trying to find the anti-christ who has been misplaced, whilst dealing with frogs falling from the sky and trying not to displease their 'bosses' from up high and in the pits of hell! 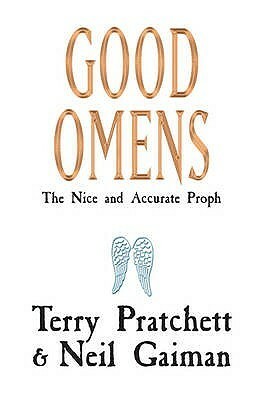 I adore Terry Pratchett and sadly miss the mad world he created not being added to in The Discworld series, but have loved this collaboration with another of my favourite writers in Neil Gaiman and in Good Omens they created a story full of so much humour, social comment and wonderful scenes that I often found myself going back over a page just to make sure I read things write and didn't miss anything! From the antics of Crowley and Aziraphale, to the side stories of a modern witch who is an ancestor to Agnes Nutter, she of the prophecies fame, and a modern day witchfinder, there are so many things that have the 'pee' taken out of them and it all just blends to make for a blinding story. I can often read a book in super quick time but this is one of those books that seem to make you slow down your reading pace as there are so many quips and general hilarity that you can't take it all in!! It's probably a book that just gets even better the more times you read it so that's what I'm planning on doing and soon! There's so much doom and gloom in the world right now, that if you're looking for a world to escape into then I highly recommend this as it's just a treat to read.